Home Business – Not Popular in The Philippines? I know you’ll be shocked as I am when I learned that home business is not that popular in the Philippines. Unlike in the U.S., home business is very popular. Why did I say that? 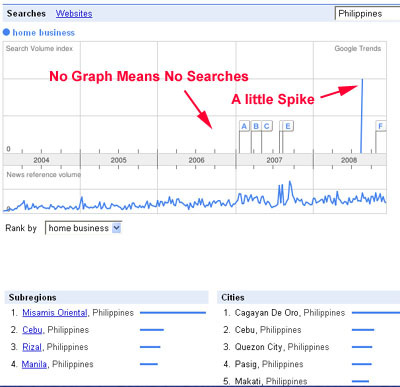 for one thing, when you type the word “Home Business” I’m number one but the visitors that comes to my website that searched Google Philippines (www.google.com.ph) using that keyword is very negligible and almost none. Maybe I’m wrong because Yahoo! is popular among Fiipinos but at least I’m sure many surfers in this country are using Google. Look below what I got by using Google Trends. The search was geographical and narrowed it down to “Philippines” by choosing it on the selection drop-down menu. Home Business Search Trend in The U.S.
Then I investigated further. I was thinking that there is something to do with the browser. Since I’m using firefox all the time, I thougth there is a difference of what kind of Google search engine will appear. Will it be geo targeted (www.google.com.ph) or the default one? (www.google.com). I discovered that Internet Explorer automatically loads a geo targeted one. 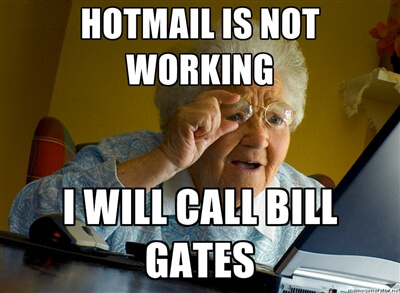 The reason why I did this is because majority of the users online use Internet Explorer. So this brings us to the conclusion that home business is not that popular here. That majority of us are not interested in home business. But on the contrary, many Filipinos are having home based businesses. Maybe the reason is those who are interested in home business doesn’t have access to the internet or not computer literate enough to search for it. This is the only reasonable excuse I could think of. How about you? 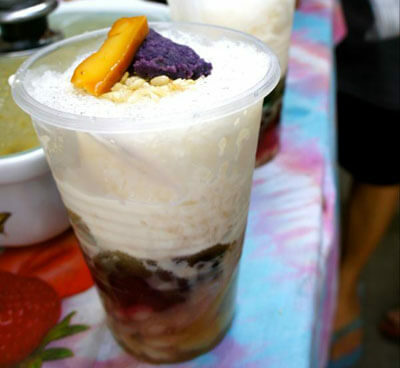 do you think Filipinos are not business minded? You have also to know the “Page ranking in Google” and how SEO (Search Engine Optimization) works. This is the reason why some keywords are not popular in search engines. There is nothing to do what kind of web browsers you’re using, its “the web crawlers” of the search engines. I was referring to the data of Google Trends which has nothing to do with “Page ranking in Google” and how SEO (Search Engine Optimization) works. Page rank and SEO concerns the individual websites or webpages that search engines ranks. What people search on the internet by using keywords of their choice is a different story. The web browser I mentioned refers to the kind of search engine whether it is Google.com or Google.com.ph. Some browsers like Google chrome will direct you to Google.com.ph while others like internet explorer or firefox will direct you to Google.com. 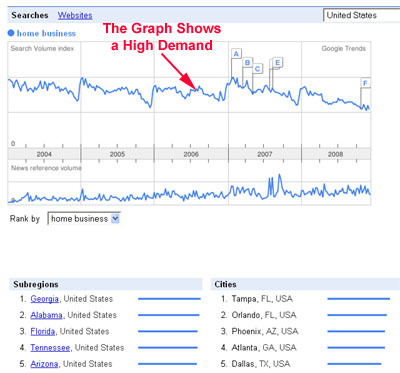 Yes this 2011 Google trends on home business has improved. Thanks for sharing that. I’m doing some research on home -based business and I think you’ll be surprised to see the updated results on google trend. Internet is not so advisable in the Philippines. Not like in the other country, every household have her own computer not only one but more. In the Philippines you can see more computer in internet cafe, department store or any big offices. So online home based business is not so well known in the Philippines. I think having computers at home doesn’t relate on the fact that home business is not popular in the Philippines. There are many kinds of home business like for example soap making, meat processing and many others. So it’s not only internet home business. 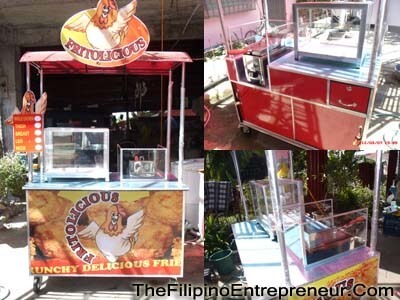 I think it’s the attitude of Filipinos that entrepreneurship is not very acceptable unlike in the U.S. that they welcome entrepreneurship. Thanks for your comment. I really appreciate it very much. Thanks again for giving me an idea how you searched for my blog. Actually there are many sites listed in the search engines that we don’t really want. The term “home business” was not really a popular keyword in the Philippines. Mostly people in the US are the ones interested on home business and it is now synonymous to “online home business” and not kind we used to know before the internet became popular worldwide. Traditional home business are now being confused by online home businesses. most online home business require a website or a blog. Having a blog or a website will give you an online presence and you can do many things if you have a blog or a website. But first you have to promote it to make it popular then aftewards the money rolls in (i.e. sell sutffs, join affiliate programs or accept advertising). But you can also have an online business without having your own website. For instance eBay or online classified ads like sulit.com.ph. You can sell thru those website by registering. Just research on the internet first for opportunities then decide when to start.